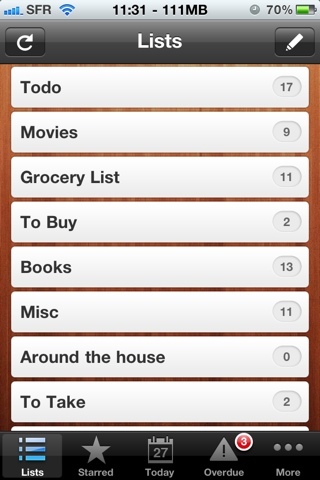 One of the most common things I do on my iPhone is manage lists. 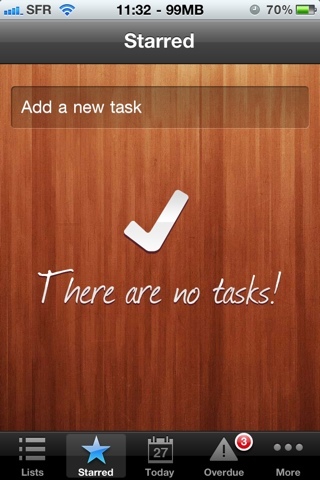 So naturally I've compared a lot of different task management and list applications. For years I was a user of Zenbe Lists but for some reason it stopped working a few weeks ago and my hunt for the ultimate list management app was on again. And then I ran into Wunderlist. The Wunderlist iPhone app is pretty much everything you could want from a list management app: it looks good (and has 12 themes to choose from), lets you create multiple lists, lets you rearrange list items, star items, set due dates, is easy to use, and it's free. Not only that, it also syncs between your different devices and on the web. It even includes advanced functionality like adding tasks by email and list sharing so that you and your spouse can both add items to your grocery list. Bottom line: I highly recommend you use it for managing any lists or tasks.